This volume’s primary goal is to provide a comprehensive understanding of recent developments and advancements in the study of ataxic disorders. 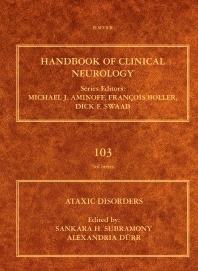 Beginning with an examination of the cerebellar region, and then progressing to a fresh perspective on the clinical aspects of the various forms of ataxia, this handbook gives clinicians a state-of-the-art reference for the management of the many etiologies and neurological manifestations of ataxic disorders. Clinicians will gain a broader understanding of generative ataxias and the genetic disorders associated with them. In addition, new neurophysiological and imaging techniques are discussed, along with an in-depth examination of the treatment and management protocols of ataxic diseases.